A Boeing 777 lands at John F. Kennedy airport with its lights off and no response coming from the cockpit. Dr. Ephraim Goodweather of the C.D.C. (Contagious Diseases Center) is called in to investigate. Once they open the plane, they discover that everyone inside, barring a few survivors, is dead, with most of them exsanguinated; drained of their blood. Goodweather and his team try to uncover the cause of this mysterious plague, only to find that some of the corpses have started to change, physically, and are coming back to life in search of sustenance. I love Guillermo del Toro. Whether he's making small, Spanish-language offerings or huge Hollywood affairs, he brings a huge and unquenchable imagination to them, conjuring up images and ideas that are truly breathtaking. Now, he turns his hand to a novel, co-written by Chuck Hogan, that deals with a subject that his dealt with in two of his films; vampires. Originally planned as a television series, a detailed procedural akin to The Wire, but with vampires, The Strain is a hugely imaginative, if occasionally sluggishly written, entry into the recently revived genre of vampire fiction. Of course, by dint of being a vampire novel, does owe a lot to Dracula - the opening chapters, in which a plane lands at J.F.K. with seemingly no one left alive on board, deliberately evoke the image of the wraithlike Demeter running aground at Whitby - it stands more in the tradition of Richard Matheson and his seminal work, I Am Legend. Del Toro and Hogan take a deliberate and methodical approach to the nature of vampirism, providing possible explanations for their weaknesses, the ways in which their digestive systems work and how the disease spreads from person to person. The authors try something new with the vampire, or at least something different. The vampires are not swarthy, lustful types, they appear to be little more than savage beasts driven by their hunger, turning people into their own kind left and right in search of food. The descriptions of these creatures, with a vicious stinger that comes out of their necks, rather than the traditional elongated canines, is vivid and terrifying. They seem just human enough, but with that extra, oddly phallic detail to through things off. It's refreshing, after all the years of cultured, slightly wimpish vampires that we've seen and read about, to read something in vampires are truly malevolent beings that destroy things with no regard or notion of what they are doing. By having Goodweather work for the C.D.C. the authors are given ample opportunities to pontificate on how vampires could exist in a rational world of science. Their attention to detail and the ceaseless logic of their approach heightens the terror at the heart of the novel by making it seem plausible, at least within the world of the novel. 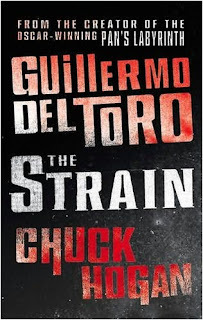 Drawing upon contemporary fears of biological warfare, pandemics and the inability of governments to protect their people, Del Toro and Hogan give their work an urgency that could easily be found in a 'straight' crime novel or the sort of science gone awry cautionary tales that the late Michael Crichton used to do so well. However, this very same approach to the subject matter is occasionally the downfall of the novel since it can make some passages seem terribly dry, and information is sometimes repeated, to no great gains. The minutiae of how a group like the C.D.C. would work drag and stand in stark contrast to the wildly imaginative creations that are the vampires and the breathtaking pace at which some of the book progresses. The disparate focus of the book is also an issue. After the plane is emptied of its cargo of dead and nearly dead passengers, the corpses start coming back to life, whilst those left alive slowly find themselves hungering for blood. The book follows each of the ''survivors'' as they return to their homes, as well as the lives of people who happen upon the walking dead, and in trying to encompass all these narratives Del Toro and Hogan wind up delivering stories that are rather samey. Some of them are amazing, though. One involving a woman who keeps her turned husband locked up in the shed at the back of their house because she can't bear to lose him, is by turns horrific, moving and deeply unsettling. These moments are too rare, though, as the sublime is often surrounded by marshes of workmanlike writing that, whilst perfectly fine, often doesn't match the imagination that drives the book along. Its the first entry in a trilogy, with the subsequent books following annually, and even with my misgivings about the mechanics of the plot, the scope of the story and the power of its imaginings has me positively salivating at the prospect of future installments. The book ends of a definite cliff-hanger, and if the titles of the second book, The Fall, is anything to go by, it seems that things will only get darker as time goes on. I can't wait to sink my teeth into it.